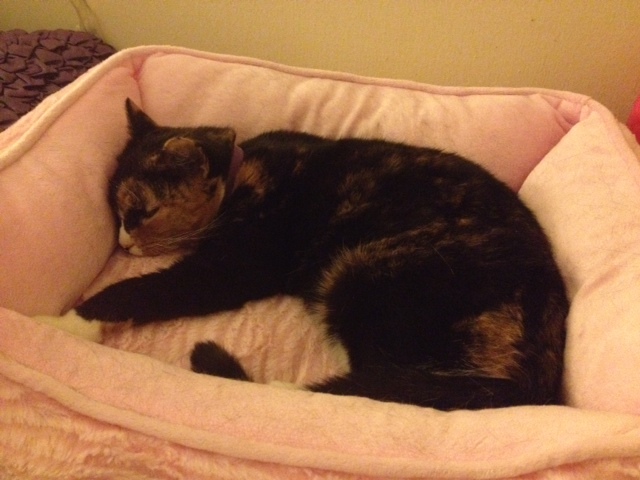 Callie, asleep in her princess bed. Those four words describe my Sunday mornings for the past few weeks. I absolutely love them! I get up early, by around 6, just because I’m kind of slow moving until I get my coffee fix. Then by 730, I’m getting on my way to the zipcar that will take me to the ARL in Dedham and its barn animals. Right now, the livestock population is small, and this is a good thing because all of the livestock animals are there as law enforcement cases, so the fewer, the better for the state of the animals. Two of the goats were adopted over the past two weeks, so there’s only the pregnant one left inside the barn, along with the pigeons/doves, and chickens and roosters. Last week, I met the other (long time) Sunday barn volunteer and we get along great, and even discovered that we grew up about a half hour away from each other, in upstate NY! It really is a small world sometimes. After visiting with Fancy, I had some time left before I had to return the zipcar, so I spent some time with two cats whom I was told were absolutely terrified when they were brought in. They were both what they call “known strays” in their neighborhood. You could definitely tell they were each scared when I started to talk to them in turn, as they were shaking and their breathing was rapid. I found that soft talking and some quiet singing seemed to calm each of them down (and the girl cat especially appreciated Temptation treats.) Each of them were closing their eyes and nodding off as I left them. The boy cat even let me pet him, ever so lightly. So I hope to help put them both at ease again this Thursday when I go in on the holiday. I hope that if you have a pet, this post makes you want to reach out and give them a few loving pats or a kiss or two. It might be hard to forget sometimes, but there is a lot of good in this world and sometimes all it takes is to look into the eyes of a gentle creature, to remember that. I can’t wait to start learning more about how to take care of them when they are sick or need help. Working with animals seems to truly be my heart’s calling. Just took me a little bit of time to realize it. (Ok, 42 years, but better late than never.) Now, I really look forward to my Sunday mornings. I hope that each of you out there has had a great weekend and isn’t allowing the holiday season to stress you out too much. Just remember that a lot of it is media hype and snazzy advertisements. If you’ve liked this post, please hit like or subscribe, and Happy Holidays! 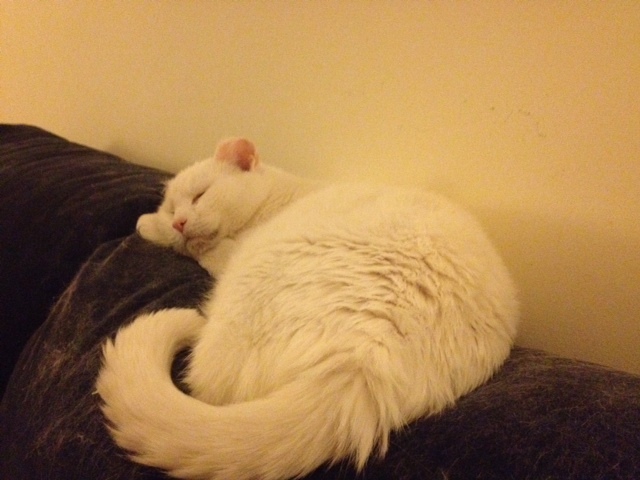 Bonkers, asleep in his new favorite place to be, on top of the couch. What a lovely way to spend some time on Christmas morning, Terri! Thanks, Ginny! The animals need love too, you know? I’m really looking forward to it. Easy is a song by The Commodores but Lionel Richie was their Beyonce so you were close =) I still listen to The Commodores and Lionel all the time. Classic soul is my favorite genre, can’t stand anything made after the 2000’s. Lionel Richie, Micheal Jackson and Cyndi Lauper were my first musical memories. We had cable tv when I was a small child in the 80’s and they were always on. Can’t believe you spend your own money on a Zipcar to get out to the farm to volunteer. On top of that, you have 2 jobs. You’re a good woman Terri Brown! Glad you found your happy place and its amongst the animals. Animals do make for better companions and friends than people sometimes or most of the times =) No poop report this week? Must be a good week. The holiday season doesn’t stress me out but I haven’t made it out to the malls or Target yet. I ended up grabbing some needed truck gear and tools off of amazon. Heavily discounted during this time and everything dropped off at the door makes me happy =) I will have to hit up the mall this week for some new glasses and shades to use up all of my FSA funds though. Not looking forward to the mall scene, it’s the ghetto mall too. The rich people mall is too far away and way more packed. Hope you and your animal family have a very Merry Christmas! Yep, Ramen, I rent a car to get there! It’s still cheaper overall than owning a car while in the city, that’s the way I look at it. I pay $9/month for insurance so that if anything happens, I can just walk away, and you get up to 180 miles per day, plus they pay for the gas. I used to just pay for the car whenever I rented it but I recently changed over to a plan that is $50/month (since I know I’ll be using it once per week) and you also get a discount on the hourly rate, which is awesome. Weekends are usually a few more dollars per hour than during the week. Needless to say, I always look for the cheapest car rate close by me, and I”m lucky that there are about 4 locations with zipcars within about .3 miles of me. So yes, I’m spoiled! And the poop report, I forgot to mention – when I come in and clean up after the pigeons, the long beam that they use to sit on and poop, well, it’s over my head since I’m only about 5 feet tall. So I leave their pen for last, just in case any of it lands on me. I’ve now figured out that I just scrape it in a direction away from me and then just shovel it off of the ground. Oh, and the other lady took care of the horse – that’s my job for Thursday! Did I ever mention I saw the Commodores in Vegas? It was about 12 years ago, and no, Lionel wasn’t with them, of course. “I know you’re not alone…on the Night Shift…..” LOL I hope you will have a great Christmas too! That car share system sounds good for city folks. Not too many option for suburbanites. I pay $90 a month for my car insurance, fill up around 2.5 times a month and pay $500 for payment on my truck. But I have 0% interest and only 1 year left =) I really shouldn’t have totaled the amount, now I’m sad thinking about this near $750/month amount =( You also don’t have to worry about maintenance which is a bonus, it all adds up. Glad you’re able to get a discount on the workout clothing. Its good to reward yourself every once in a while. Also nice that NB also makes some stuff in the USA still. Hope you wear a hat while in the pigeon house. I would call it quits if they had me doing that. Its one thing to dodge mines, but having it rain on you, heck no. LOL, What I do is to push the poop away from me and stand on the other side of the beam so it can’t land on me! 🙂 But they always freak out and fly over your head, which I could do without…. And yes, I understand not wanting to see the final tally – just concentrate on how much it comes down month after month, that’s what I do with my student loans. And I think I will maybe hit up the outlet store the day after Christmas. I figure they will have even more sales, and I can get 40% even off of the sale price! And I have a 25% off coupon! Yes, zipcar works for people in the city. IF I were in the suburbs or anywhere else, I’d have a car for sure. When I moved into the city from the suburbs, my car insurance literally doubled….ugh. Merry Xmas, Ramen! Good luck on the outlet shopping. Don’t think you are the only one headed to the outlets for after xmas sales. Those places get packed and watch out for the rogue strollers…Another good thing about not having a car is not worrying about vandalism. Had that happen to me the other night. My poor truck was collateral damage as I picked the wrong spot to park in. About $300 in damage is what I’m looking at. I’ll send you a photo….C’est la vie. You are right – it is easy to forget about the good. There is lots of it. People like you! Nothing like connecting with another species and feeling the unconditional love. Thank you so much, Kim! And you are right, it’s the unconditional love of animals that I find so amazing. They don’t have mean bones in their bodies. Wish humans could be more like them! Rob, you caught me. I’ve done that in the past, but I was just too lazy yesterday! Be careful on those lyric sites. They’re always filled with adware and other nasties. Yeah, actually I usually end up going to youtube and searching for a song and the lyrics and that way i can listen to it at the same time too!